NOTE: Before purchasing, check with your instructor to ensure you select the correct ISBN. Several versions of Pearson's MyLab & Mastering products exist for each title, and registrations are not transferable. To register for and use Pearson's MyLab & Mastering products, you will also need a Course ID, which your instructor will provide. T his package includes the loose-leaf version and MyEducationLab® with Enhanced Pearson eText. 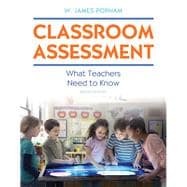 Jim Popham’s widely popular Classroom Assessment shows teachers how to use classroom testing skillfully and formatively to dramatically increase their teaching effectiveness and make a difference in how well students learn. As in past editions, the author pays particular attention to the instructional payoffs of well-designed classroom tests and highlights the implications of testing on teaching throughout in special But What Does This Have to Do with Teaching? sections in each chapter. Decision Time vignettes present practical classroom problems and show readers actual decisions being made. Parent Talk features describe situations in which a teacher needs to explain something about assessment to parents and show what the author would say in that situation. And a lighter tone is established with cartoons to which readers can relate. The new Eighth Edition highlights the increasing importance of educational assessment in an era of common core state standards and teacher evaluations based on students’ tests scores, incorporates the Standards for Educational and Psychological testing guidelines throughout relevant sections, and includes a new section on instructionally diagnostic tests to help readers evaluate the merits of commercial or locally developed diagnostic assessment. MyEducationLab is an online homework, tutorial, and assessment program designed to work with the text to engage students and improve results. Within its structured environment, students see key concepts demonstrated through real classroom video footage, practice what they learn, test their understanding, and receive feedback to guide their learning and ensure they master key learning outcomes. W. James Popham has spent the bulk of his educational career as a teacher. His first teaching assignment, for example, was in a small eastern Oregon high school where he taught English and social studies while serving as yearbook advisor, class sponsor, and unpaid tennis coach. The recompense meshed well with the quality of his coaching. Most of Dr. Popham’s teaching career(took place at UCLA where, for nearly 30(years, he taught courses in instructional(methods for prospective teachers as well as(courses in evaluation and measurement for(graduate students. At UCLA he won(several distinguished teaching awards. In(January 2000, he was recognized by UCLA(Today as one of the university’s top 20(professors of the twentieth century. (He notes that the twentieth century was a full-length century, unlike the current abbreviated one.) In 1992, he took early retirement from UCLA upon learning that emeritus professors received free parking. Because at UCLA he was acutely aware of the perishability of professors who failed to publish, he spent his nonteaching hours affixing words to paper. The result: over 30 books, 200 journal articles, 50 research reports, and 175 papers presented before research societies. Although not noted in his official vita, while at UCLA he also authored 1,426 grocery lists. His most recent books are Transformative Assessment (2008); Instruction That Measures Up (2009); Transformative Assessment in Action (2011, ASCD); Mastering Assessment (2011, Pearson); Unlearned Lessons (2009, Harvard Education Press); Everything School Leaders Need to Know About Assessment (2010); and Evaluating America’s Teachers: Mission Possible? (2013, Corwin). He encourages purchase of these books because he regards their semi-annual royalties as psychologically reassuring. In 1968, Dr. Popham established IOX Assessment Associates, an R&D group that formerly created statewide student achievement tests for a dozen states. He has personally passed all of those tests, largely because of his unlimited access to the tests’ answer keys. 1. Why Do Teachers Need to Know about Assessment?